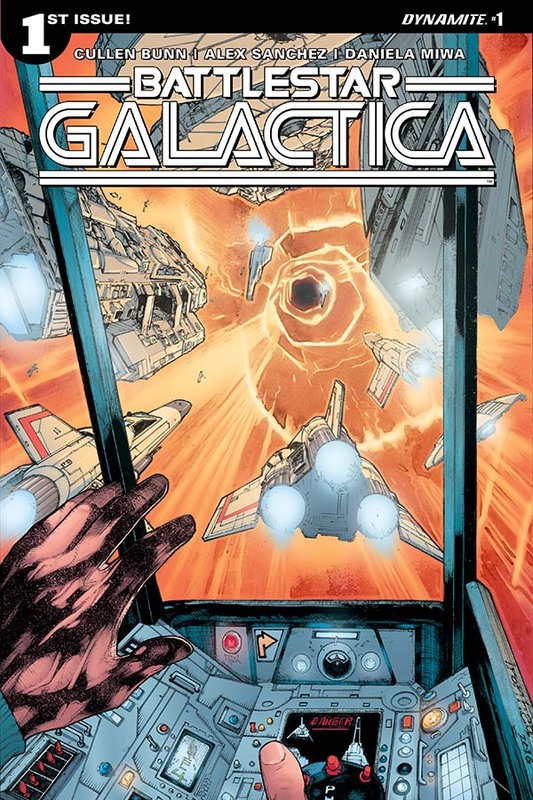 The Fellowship was fortunate enough to obtain a copy of BATTLESTAR GALACTICA #1 from Dynamite Entertainment. The story is by Cullen Bunn, with pencils by Alex Sanchez, colors by Daniela Miwa, and letters by Sal Cipriano. The colonial fleet, in their continued effort to locate Earth and the fabled 13th tribe, encounter a black hole that appeared from nowhere. Adama reluctantly orders the fleet to go through in an effort to minimize the damage and loss of life. The fleet barely survives, but not without a costly price. Adama lies in a coma, but there is something else going on. Meanwhile, Blue Squadron launches to scout what is ahead of them. Little do any of them know…they weren’t the only ones who went through the black hole. I loved Dan Abnett’s run on BSG, and now the baton has been handed to the more than capable hands of Cullen Bunn. And he does not disappoint. There’s quite a bit of action and intrigue, and at the same time reintroducing the characters. Alex Sanchez’s pencils give a unique look to the characters and ships, but what really knocked my socks was Daniela Miwa’s use of colors. I’m very interested to see where things go from here. BATTLESTAR GALACTICA #1 is available for ordering at www.Dynamite.com.